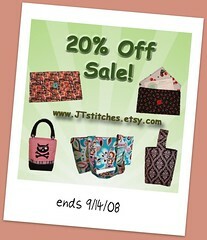 JT Stitches is having a 20% off sale everything in my Etsy shop except items in the "Custom" category. I will be adding a few things during the week so keep checking back if you don't see something now. To receive the discount I can either refund you the difference or convo me & I will edit the price in the listing.